I arrived in Minneapolis after just shy of 4 years of international travel. This is my first time back in the States since I departed from San Francisco in November of 2007. I can say that visiting is a cultural head rush. When person is away from their inbred culture for a longtime, it is easy to view the flaws within the culture. Unfortunately, I view several flaws that works against the positive peaceful life all humans should be living. Despite the negative flaws of the American Dream Culture, and dreamland it certainly is, Minneapolis is a nice city to visit and is the top rated bicycling city in the country. 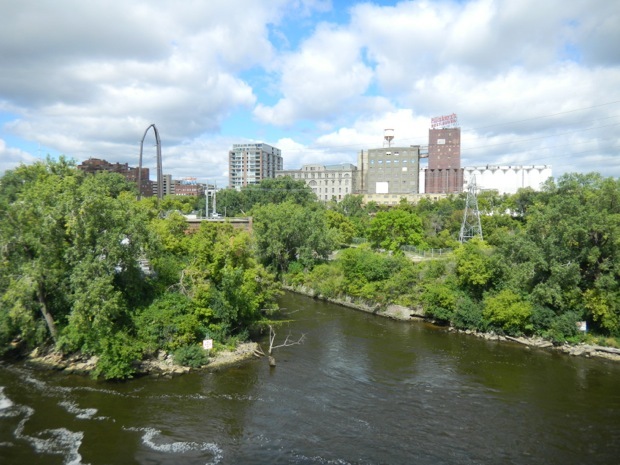 Minneapolis was destined to be a center of commerce due to its location at the Falls of St. Anthony (very top picture), which was named by the French explorer Fr. Louis Hennepin in 1680. 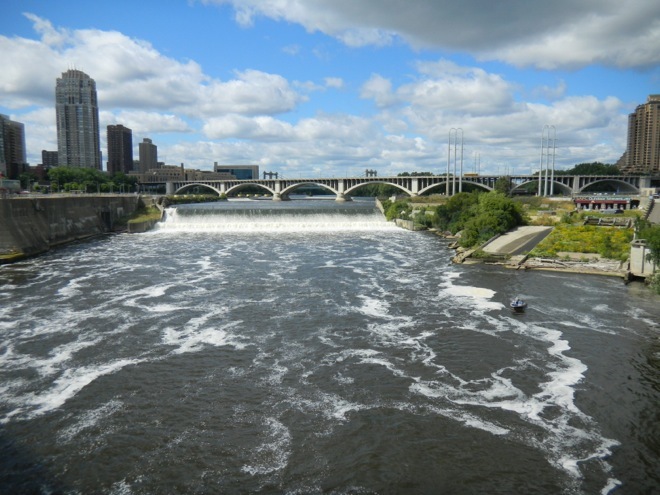 St. Anthony Falls is by far the largest source of water power on the Mississippi River. 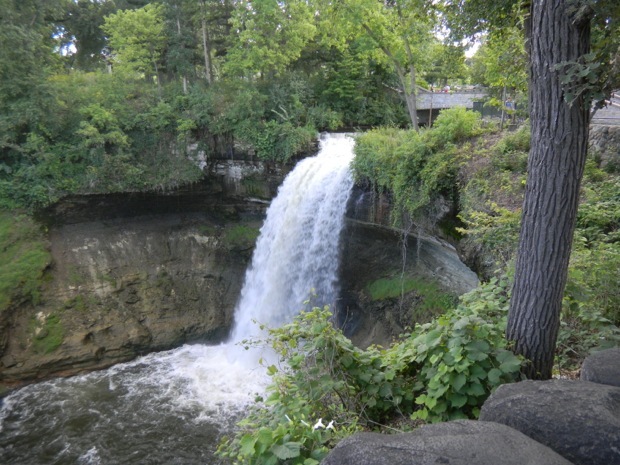 The falls were harnessed to power lumber mills in the 1840s and later for flour milling. By 1870, Minneapolis on the west bank and St. Anthony on the east bank formed the largest flour producing center in the world. In 1872, Minneapolis absorbed its older neighbor. Most of the old St Anthony township is now known as Northeast Minneapolis. A small part of the old township comprises most of the current suburb of St. Anthony. The name “Minneapolis”, meaning “The City of Lakes” in a mash-up of the Dakota word minne and the Ancient Greek word polis, refers to the city’s 22 natural lakes. The local jewels are the “Chain of Lakes”: Cedar, Isles, Calhoun, Harriet, Nokomis, each 3-4 miles around. The city’s excellent parks department maintains walking and biking paths around the lakes, offering residents a place to exercise or stroll. The Lake Harriet Bandshell is a popular summertime event host often featuring the renowned Minnesota Orchestra. Don’t miss a ride on the restored trolley between Lakes Calhoun and Harriet operated by the Minnesota Streetcar Museum. The city has done an excellent job fostering developed neighborhoods, each with a distinctive feel. Downtown is the visual anchor featuring the high-rise suites, sporting events (Timberwolves, Vikings, and Twins all play downtown), and nightclub scene. Northeast is the oldest part of the city, showing off its working-class and immigrant roots in great ethnic food, neighborhood bars, and social clubs, and more recently home to an arts and riverfront redevelopment movement. Uptown historically has been one of the city’s youth centers featuring funky food, drink, theater, and plenty of tattoos and mohawks, but is orienting more towards yuppies and young families as real estate anywhere near the lakes becomes an ever more prized commodity. Uptown and the Lakes area dissolves into quiet, tucked-away Linden Hills (a one-time bedroom community) to the south and Lyn-Lake, home to many indie stages, music-oriented cafes and boozers, and alternative lifestyles and hangouts of all sorts, to the east. The University of Minnesota’s main campus straddles the Mississippi River in the southeast surrounded by the usual college campus environs. Biking in Minneapolis is a big deal. Over the years, it has invested heavily in bike trails, lanes and “bicycle boulevards,” and a good chunk of its populace uses the man-powered two-wheeler to get around. Minneapolis has 46 miles of streets with dedicated bicycle lanes and 84 miles of off-street bicycle paths. Strangely, over 50% of people in Minneapolis are fat, thus providing plenty of room on the bike trails. 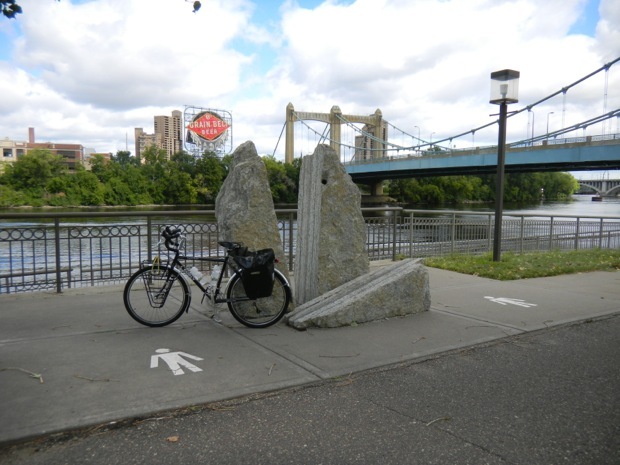 The larger Twin Cities area also offers a good mix of off-road bike trails; for example one can bike from Chaska to St. Paul using only bike trails, some thirty miles. A variety of maps show the web of on and off-road routes that span the greater metropolitan area. During the winter, major bike trails such as the Midtown Greenway are plowed at the same time as major streets. In some neighborhoods like Downtown, Dinkytown, Uptown, and near the University of Minnesota campus, bikes are seen almost as often as cars. One of the country’s largest urban bike rental programs opened in the summer of 2010. Nice Ride Minnesota two-wheelers are available for rent at 65 locations. No discussion of getting around Minneapolis would be complete without mention of the Skyway. Covering most of an approximate 7×7 block region of central downtown, the Skyway is a series of public pedestrian spaces on the 2nd floor of downtown buildings connected by enclosed bridges between buildings. It is possible to walk through most of downtown and never go outdoors, a real advantage during winter. Additionally, the Skyway allows you to bypass stoplights and quickly move through the city. Beyond the core region, the Skyway reaches about 12 blocks in the north/south direction and 8 blocks east/west. The Skyway is home to multiple restaurants, stores, shops and malls. If visiting downtown Minneapolis during the winter, using a parking deck or staying at a hotel on or very near the Skyway is well worth the investment. Hours vary slightly, but most buildings are open noon-6PM Sunday, 6:30AM-9PM or 10PM M-F and 9:30-8PM on Saturday. Mall of America is the nation’s largest shopping and entertainment destination featuring over 520 stores, 50 restaurants and the largest indoor Nickelodeon theme park- Nickelodeon Universe. SeaLife Aquarium, LEGO Imagination Center, American Girl Store, Theatres at Mall of America and Moose Mountain Adventure Golf are also fun-filled attractions available to our guests. Plus there’s no sales tax on clothing or shoes! Mall of America is located in Bloomington, MN, just 15 minutes from downtown Minneapolis and just minutes from MSP International Airport. Connect to it all with the Hiawatha Light Rail line or convenient shuttle service to Bloomington’s nearly 40 hotels, which all offer free shuttle service to the mall.